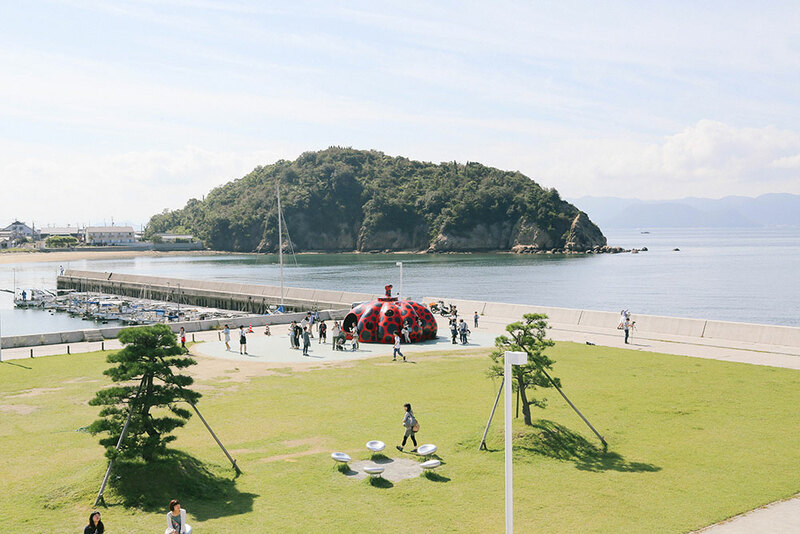 Naoshima is a small island in Kagawa Prefecture, a former sleepy fishing community now famous for its collection of contemporary art museums. Due to it’s secluded location, it has a unique atmosphere – part traditional small town, part international galleries. 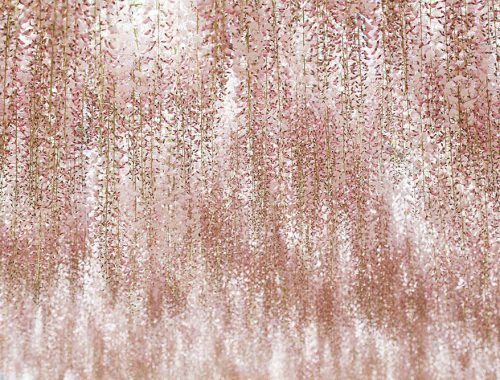 We loved this special place and had one of the most incredible art experiences of our lives. We made the journey during Silver Week and were blown away! After taking the Nozomi Shinkansen to Okayama (3.5 hours) we took a memorable journey on the local train to Uno (1 hour). Boarding at sunset, it was peak hour with standing room only. Surrounded by salarymen it felt just like an urban subway, except when we looked outside we were traveling through rural rice fields. The ferry to Miyanoura Port was beautiful at night, sitting on the deck it was silent (sans the cute toddlers running up to say hello) and the moonlight highlighting the many islands surrounding us in the black sea. 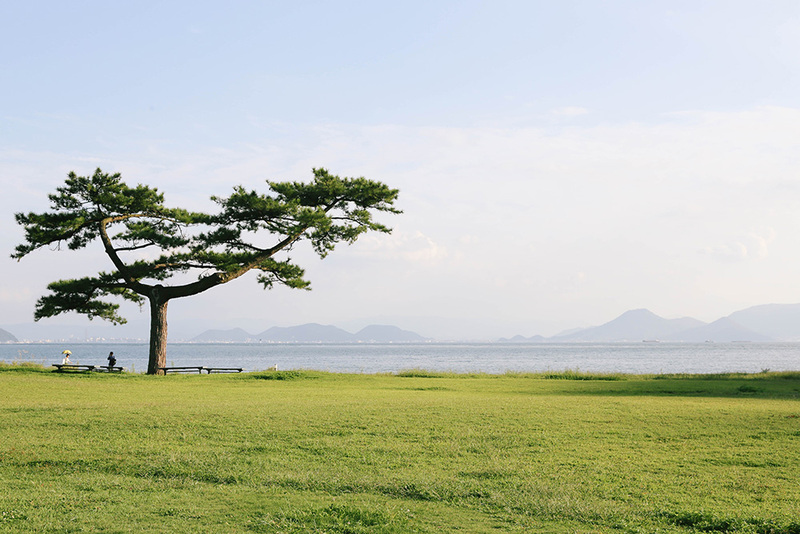 There are three main villages on Naoshima – Miyanoura, Honmura and the Benesse House area. 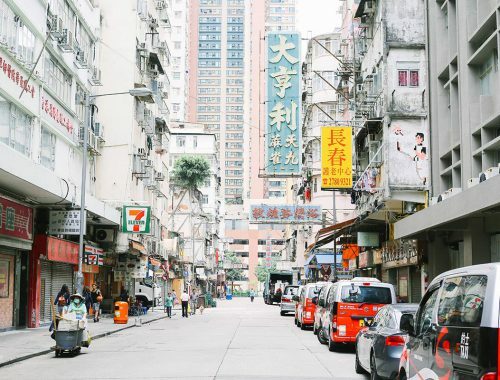 Our first few nights were spent in Miyanoura at Dormitory in Kowloon, a simple hostel right by the ferry terminal and the red pumpkin. We spent the evening exploring – with a curry dinner at Cin Na Mon, checking out the sculptures lit in the evening, testing the local sento I Love Yu and making new friends with our roommate. 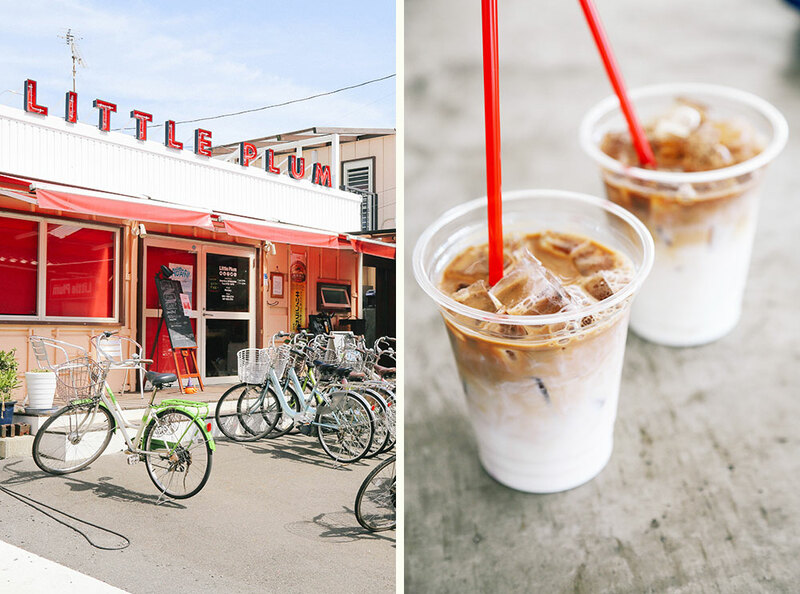 In the morning we hired electric bikes from Little Plum (1500 yen per day), grabbed some great iced lattes from Cafe Ougiya (inside the ferry terminal) and explored the Naoshima Music Festival and Naoshi Marche. We then headed out on the road and fell in love with our electric bikes – the feeling of being pushed along was incredible. We soon discovered the steep hills and winding roads around the island, and marveled at the views – sparkling turquoise water, beige beaches and golden islands dotting the landscape. Our first stop was Chi Chu Art Museum, the most incredible museum I’ve ever seen. The museum was designed around the artworks themselves, creating a carefully considered experience. 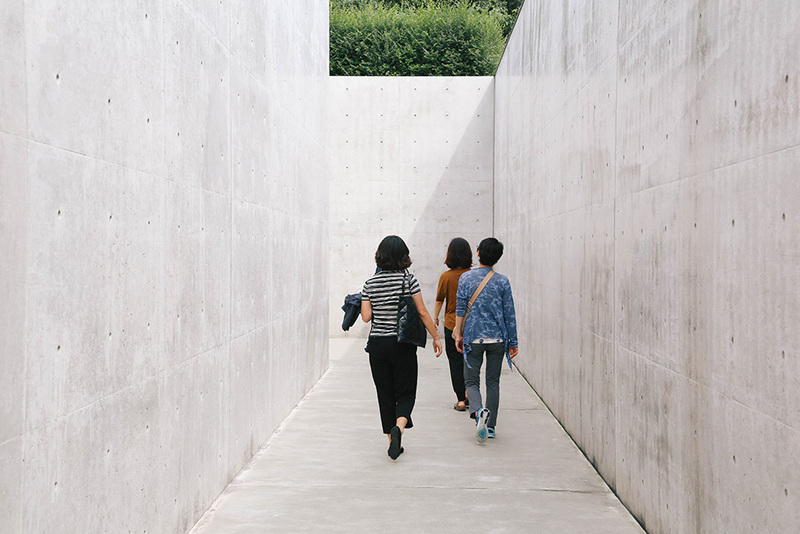 Designed by Tadao Ando, the concrete buildings are set into the earth and house works by only three artists – Claude Monet, Walter De Maria and James Turrell. As you enter, you pass a pond inspired by Monet’s waterlilies. 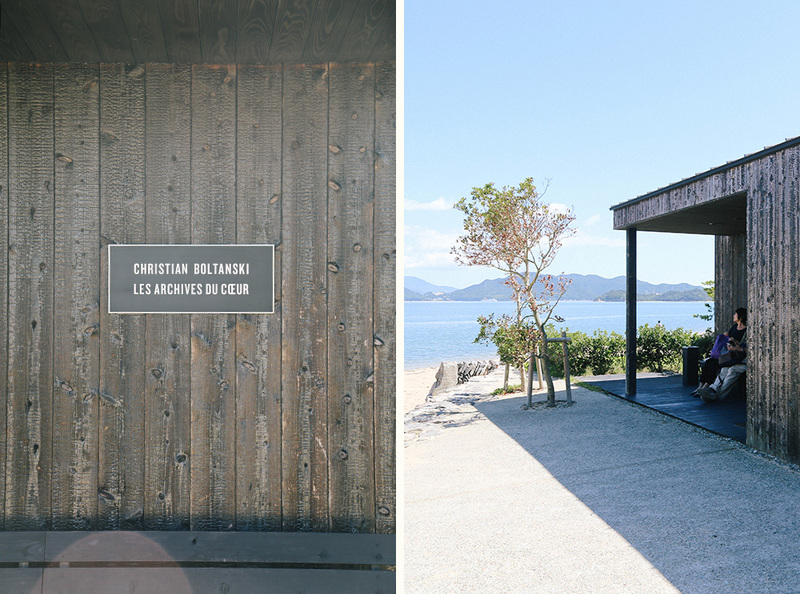 Simple sandwiches at the Chi Chu Cafe were the perfect end to our visit, overlooking the beautiful Seto Inland Sea. 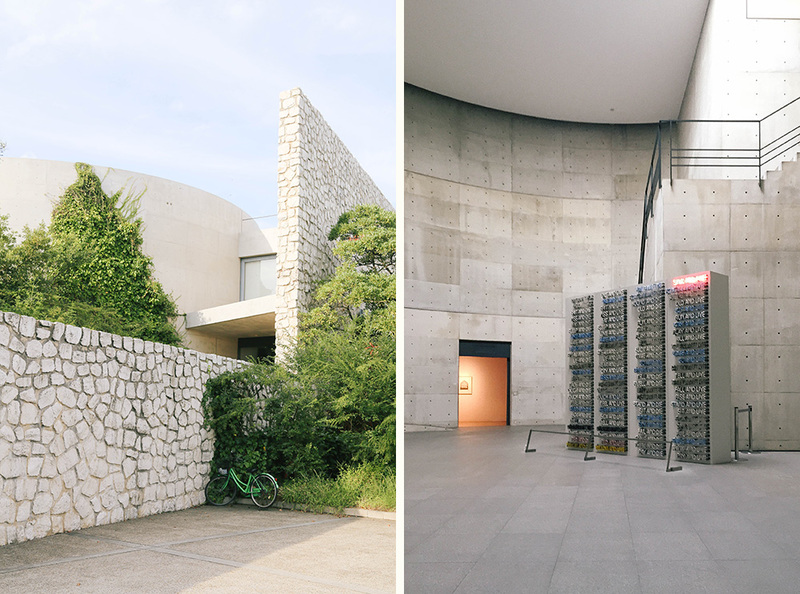 The Lee Ufan Museum was also designed by Tadao Ando, with the museum solely dedicated to the works of the Korean minimalist artist. 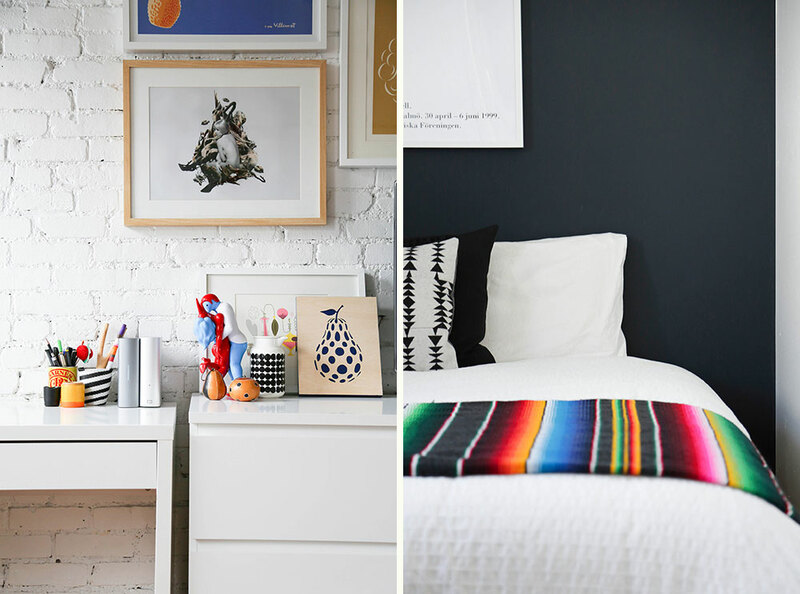 The site was a collaboration between the two, intertwining both the art and architecture. The museum is a tranquil space, partially set underground and surrounded by outdoor sculptures, hills and ocean views. 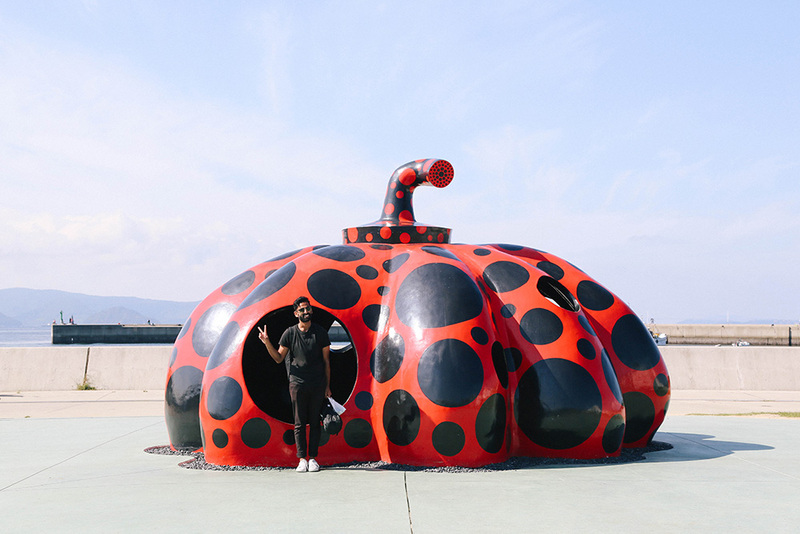 After an electrifying descent from the mountain by bike, we set our eyes on the famous yellow ‘Pumpkin’ by Yayoi Kusama for the first time. 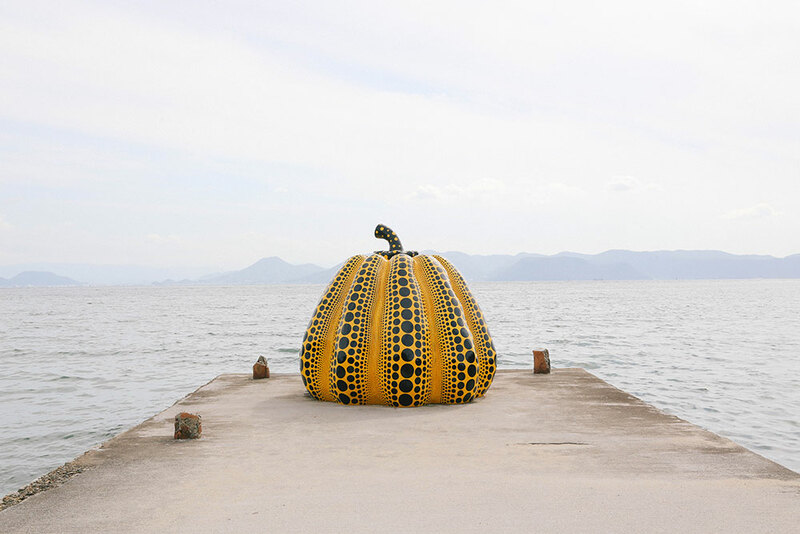 Set out on a pier, this playful yellow and black spotted creation has become an icon of Naoshima. Excited to see it first hand, visitors politely lined up along the pier taking turns to photograph one another with this masterpiece. A truly impressive sight. The largest of the three main museums on the island is Benesse House, also home to the most luxurious hotel on the island. Booking at such short notice, we sadly had no chance of staying here! The museum is large and sprawling, with work displayed both indoors and outdoors. The collection includes works from artists such as Dan Flavin, Keith Haring, Jasper Johns, Frank Stella, Andy Warhol and Gerard Richter. 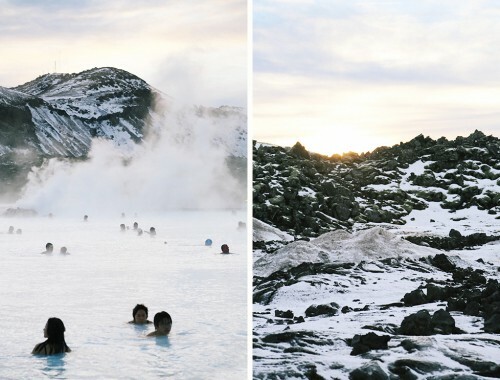 More incredible views meld the art, architecture and landscape into one. Back on our bikes we peddled to Miyanoura and followed our noses to dinner, finding a barbecue operating out front of Shioya Diner. 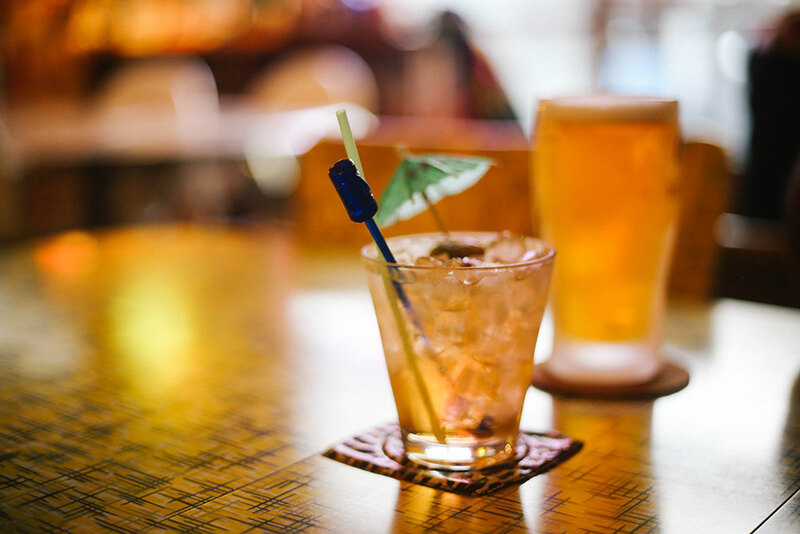 The rock and roll diner has a retro interior, a surf rock soundtrack and a menu featuring charcoal Cajun chicken, tacos and hot dogs. 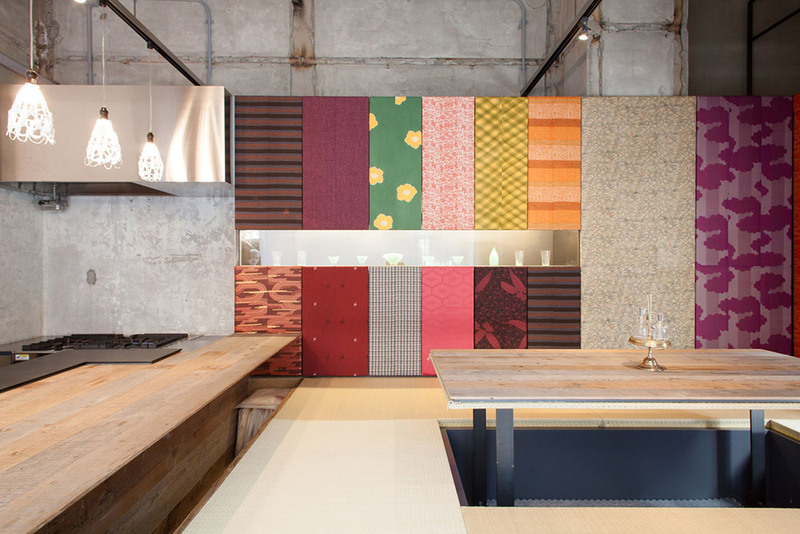 The owners Buddy and Misuzu even match the decor too! The rest of our evening was spent exploring at night, with some new Japanese friends who taught us pop songs on their guitar, while sharing some beers by the water. 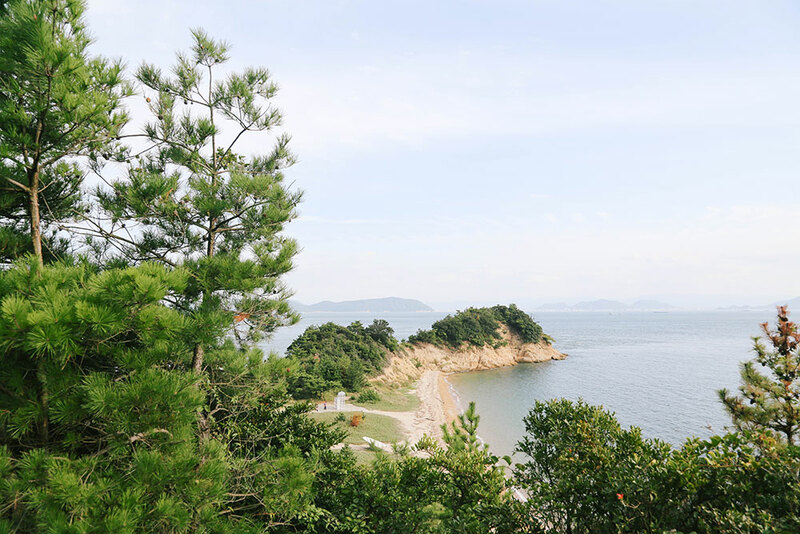 The next morning we boarded a small boat to the nearby Teshima Island. Another small rural island, it has a population of about 900 people and a handful of galleries. Like Naoshima, it’s a hilly island requiring bikes and we soon discovered that none were available. Walking along defeated in the heat, we decided to try hitchhiking and were treated to the kindness of a man who let us ride in the tray of his tiny ute. We wound around the island, waving to all the cyclists before reaching our first museum victorious. 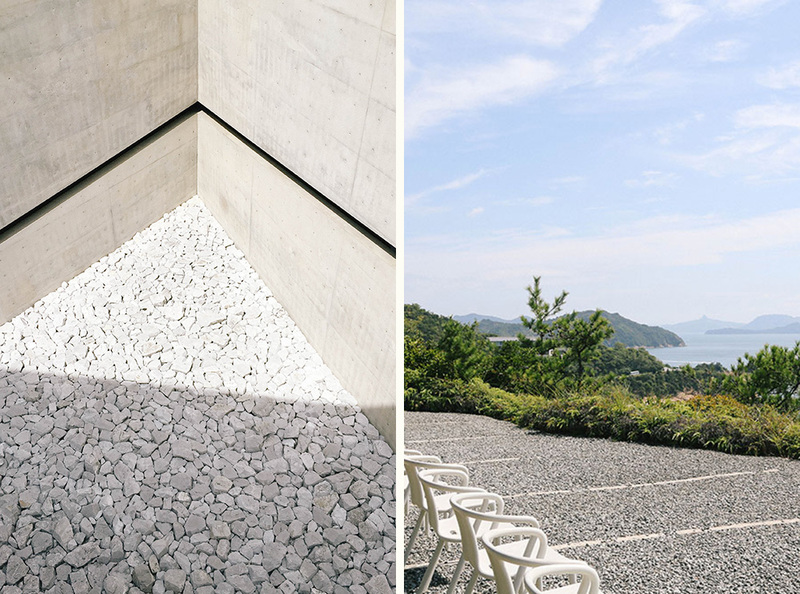 Set amongst terraced rice fields, the Teshima Art Museum is an incredible concrete structure from another world. Designed by architect Ryue Nishizawa along with artist Rei Naito the shape represents a water drop at the moment of landing. We spent at least an hour inside this peaceful space in total silence before wandering through the nearby village, with it’s tiny corner stores, outdoor installations and traditional homes. Les Archives du Coeur (The Heart Archive) is a permanent home for the project by French artist Christian Boltanski. Since 2008, the project has recorded heartbeats of people all over the world which are now stored in this modest black cabin by the ocean. Three spaces allow for recording, listening and viewing. We each recorded our heartbeats, before viewing them in the Heart Room, an installation space – an overwhelming experience. If you ever visit, be sure to listen to our heartbeats! 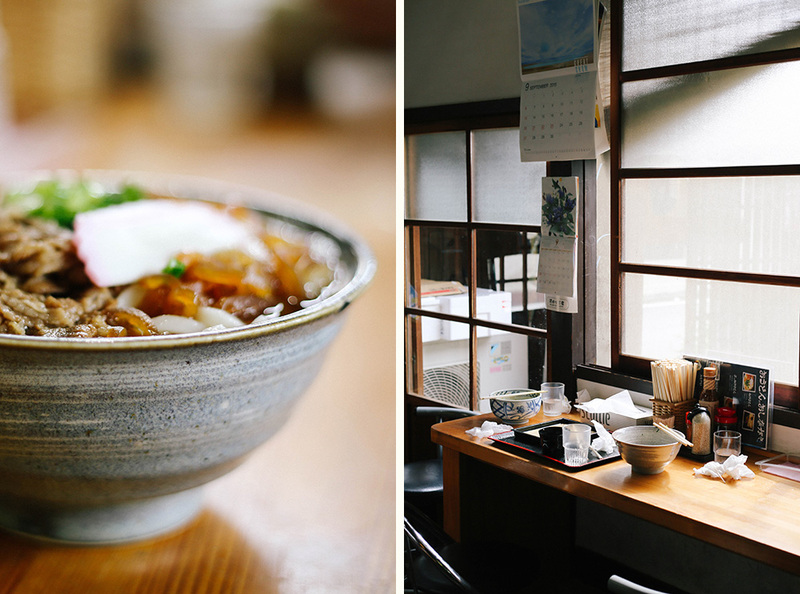 We made our way back to Ieuru Port and stopped in at Mizutamaya, a gorgeous cafe in a traditional house. 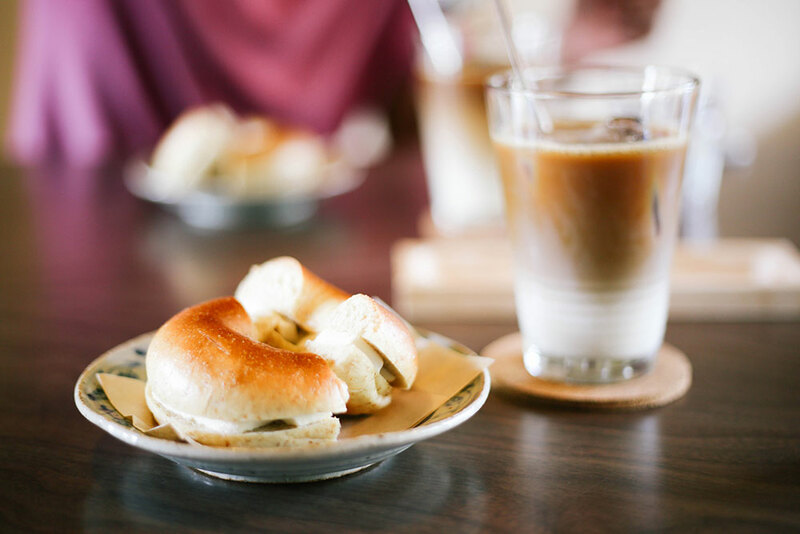 Sitting on tatami, we were treated to fresh bagels from Mamipan Bread and iced coffees by our friendly host Yoshida-san who renovated the house herself. While admiring the cute bread-themed tote bags for sale (featuring loaves, french sticks and slices) she told us about the Teshima Pan Festival, a local event she’s involved in. 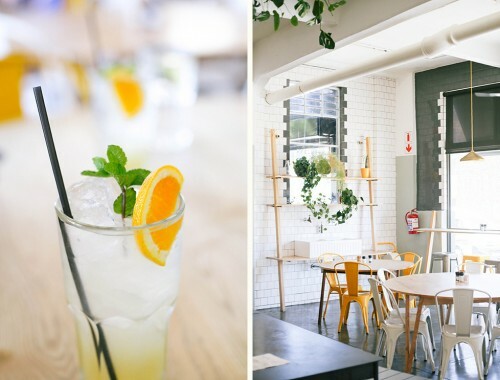 Next time, I also want to stop by the wacky Cafe Il Vento and the rustic Shima Kitchen. 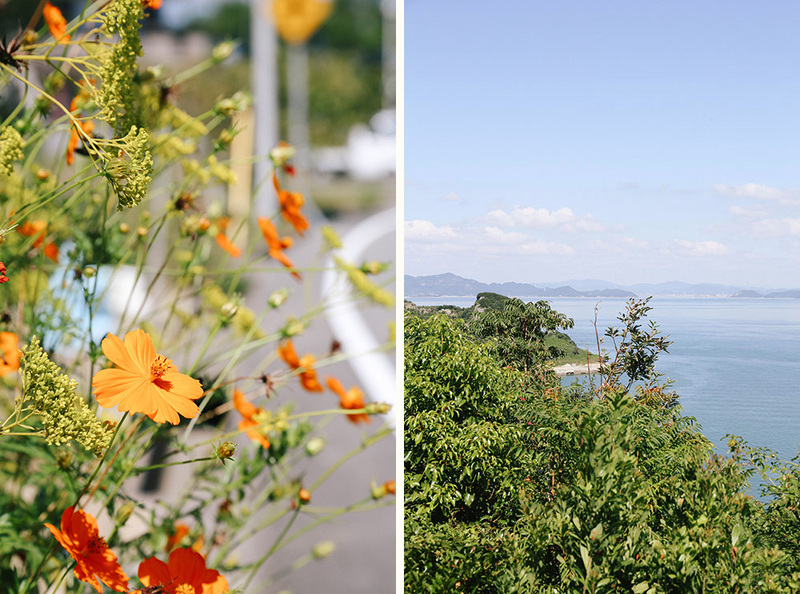 Back in Naoshima, our next few evenings were spent on the other side of the island in Honmura. 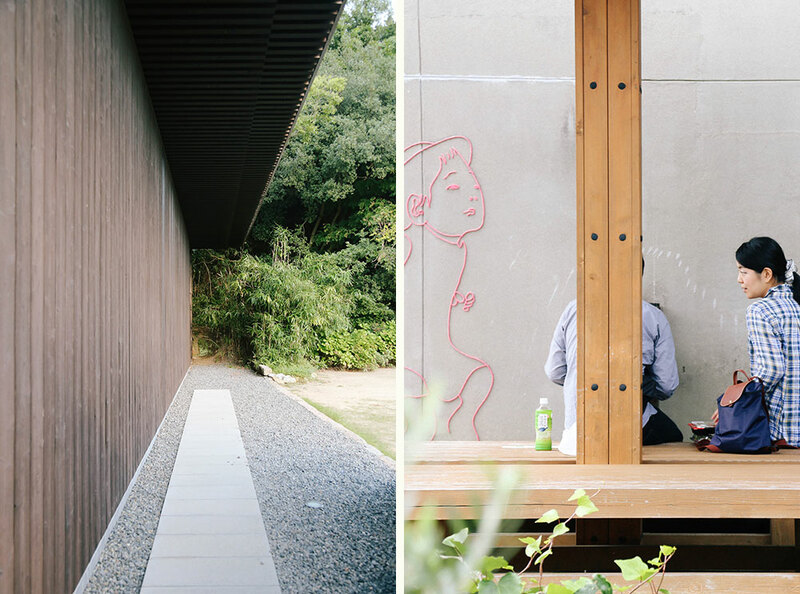 We camped in the yard at Shimacoya, a traditional Japanese house converted by Yamagishi-san and his young family into a special community space. 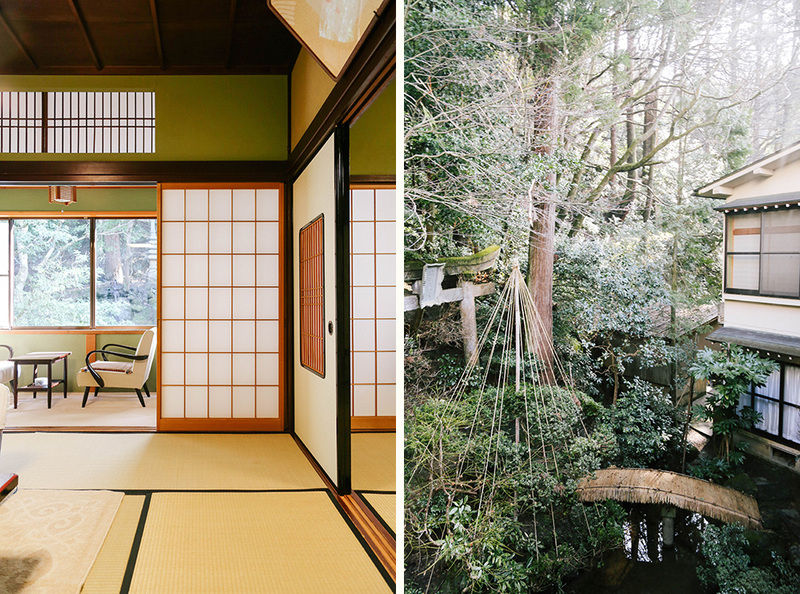 The 120 year old home is open on one side to the outdoors, with tents set up on the tatami indoors as accommodation. 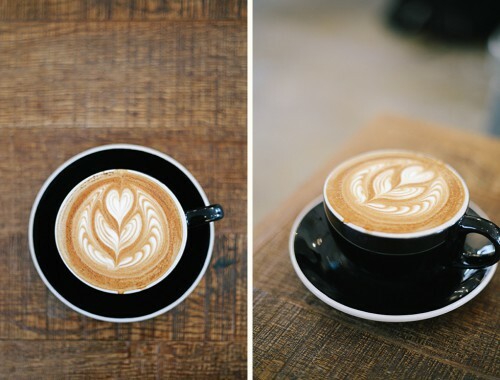 Outside the family runs a coffee stall, book market and sells second hand ceramics along with music and film events, in a hub for both locals and travelers alike! 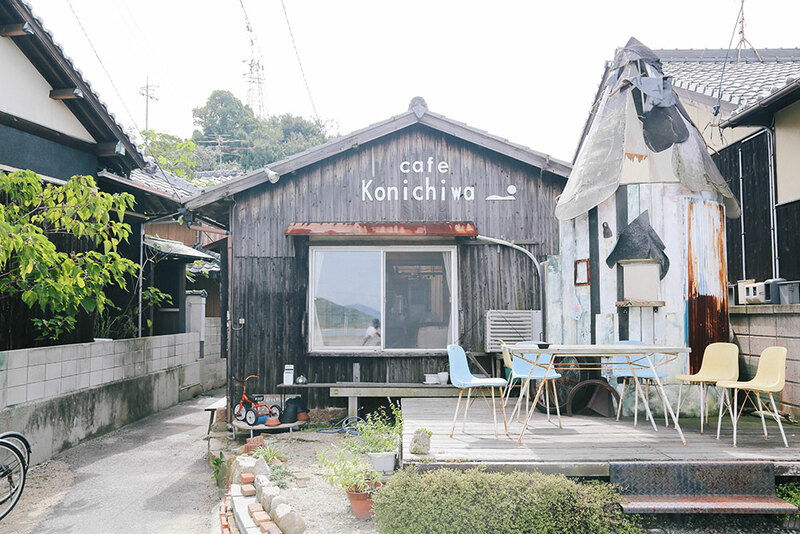 Housed in a converted home with a lovely deck out front Cafe Konichiwa is the kind of relaxed place where you can enjoy home style cooking. Over our dinner of risotto, omelette and baked vegetables we spent our evening making friends with those dining next to us. 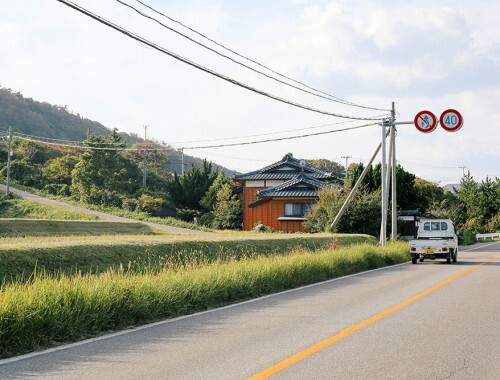 The neighborhood is full of old wooden homes and as part of the Naoshima Noren Project, many of them display contemporary noren (or fabric dividers) across their doorways to preserve the local scenery. The next morning we explored the Art House Project, a collection of 7 abandoned spaces (including homes, workshops and a temple) that have been converted into art experiences. 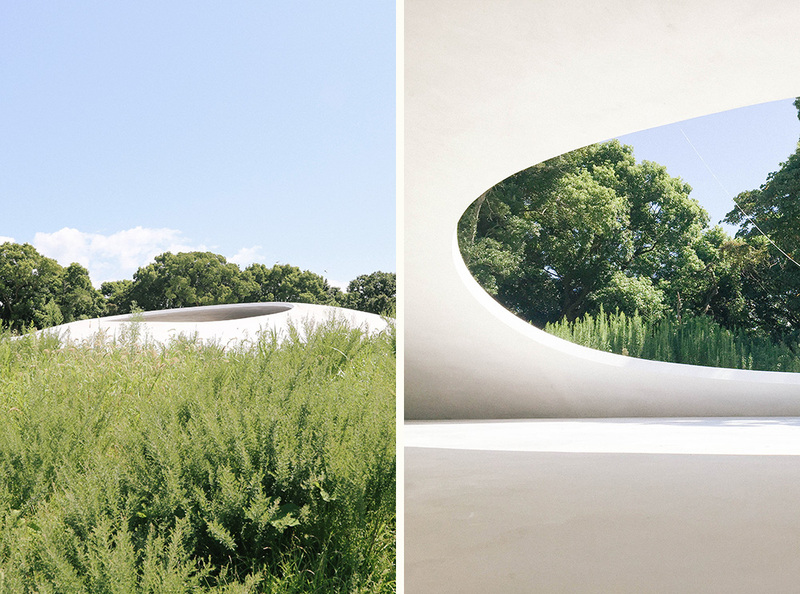 The highlight was Minamidera, a building designed by Tadao Ando to house James Turrell’s ‘Backside of the Moon’. Entering an entirely dark space, you sit for several minutes before the artwork reveals itself to you. We also saw the small Ando Museum, a tribute to the architect responsible for many of the structures on the island. For lunch we visited a bustling local udon place Ishii Shouten, (石井商店 直島) where we were surrounded by slurping customers. 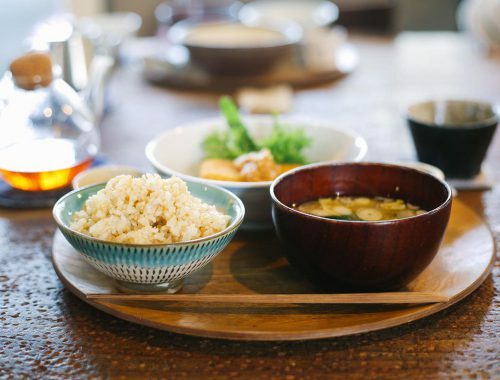 Ladies in aprons dished out delicious noodles in broth alongside fresh tempura. 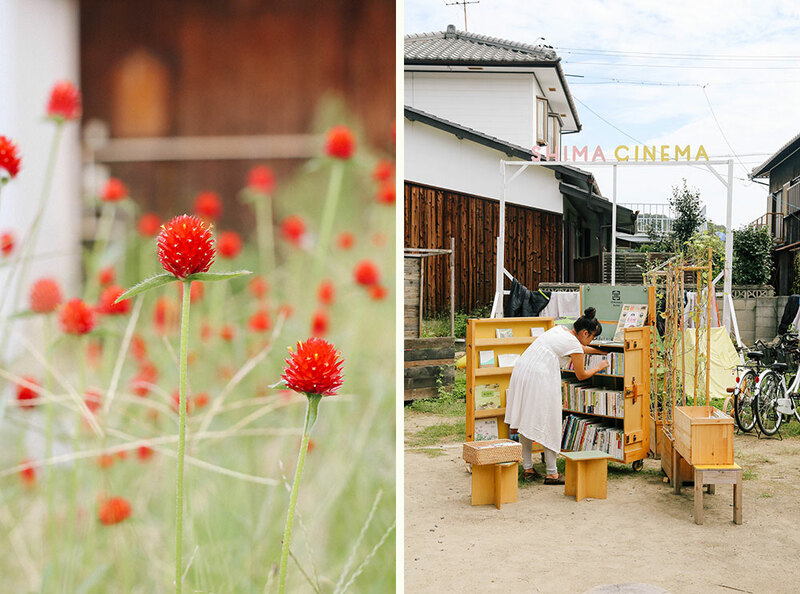 We followed this with a visit to Seven Island Cafe, where the lovely owner Iwao Yokoyama took us on a tour of his garden and taught us about his cafe that is entirely run by volunteers. He introduced us to the shiso leaf and we tasted fresh shiso juice for the first time. 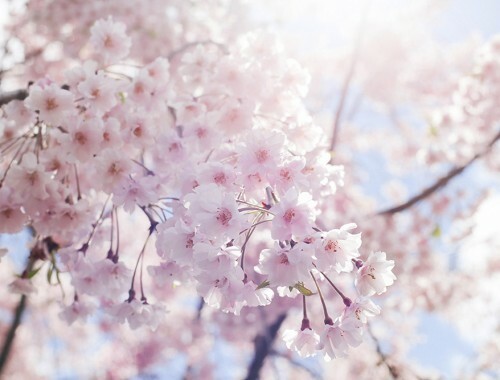 Bright pink in color, it was totally refreshing! Our last dinner was at Cafe Salon Nakaoku which like most places on the island – was hidden amidst a residential neighborhood. Following the wooden signs, we stumbled inside and found a beautiful atmosphere; a dark timber interior with tatami mats and a warm glow. 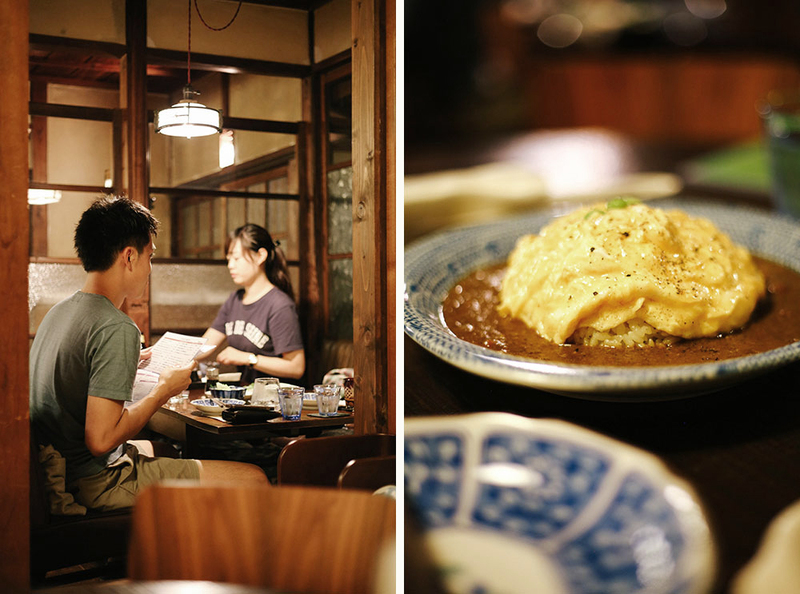 A fusion of western and Japanese food was served tapas style, including sashimi, omurice, baked potato and matcha cheesecake. Delicious! The following morning we departed Naoshima, selecting our omiyage from the store at Miyanoura Port. We chose Sola Shio Candies (直島ソラシオアメ) and Langue de Chat Cookies (直島しおらんぐ) both made from locally product salt, along with some pumpkin shaped cookies inspired by Yayoi Kusama. 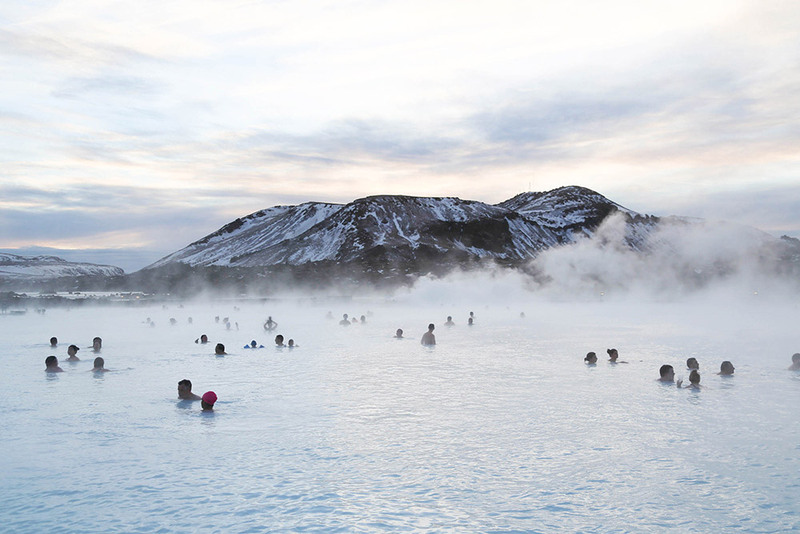 We were totally overwhelmed by our visit to this special place and can only hope we’ll make it back again someday!